Sleeve Labeling Shrink Machines Suppliers|Sleeve Labeling Shrink Machines manufacturers, in Mumbai, India. The Conveyor rods of the shrink wrapping machine which passes from the hot shrink tunnel is coated with Silicon Tubes. Shrink wrapping machines is Over backed with heat resistant power coating on Mild Steel Fabrication. Selective Model of Shrink wrapping machines comes with Heavy-Duty DC motor with Gear-Box And Special Controller for Heavy Load Bearing Conveyor.Special Seven Tank process Powder Coated Mild Steel Fabrication Body which make the shrink wrapping machine Heavy Duty And Long Lasting. Our Shrink wrapping machine is widely used in India as well in international market. Pesticides, Pharmaceutical, Textile , Cosmetics,Talcum Powder Bottle, Books, Stationery, Playing Cards, Mineral Water Bottle, Pickle bottle, Soap, Welding rods, Shampoo, Gift Items , Welding rods , Etc. 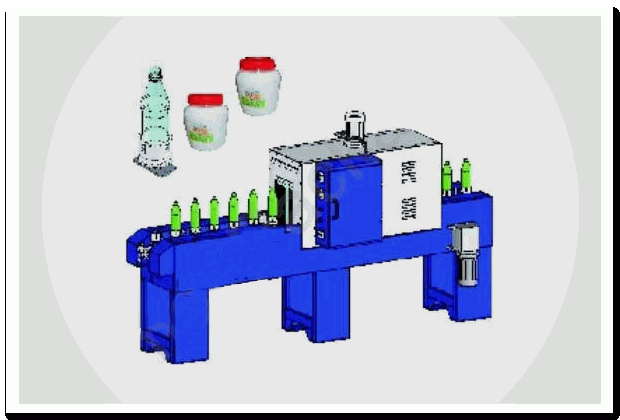 Sleeve Labeling machines suitable for bottle and other items. It's a high speed of sealing machine and high equipment sealing. The complete process is visible & is furnish. The automatic process of shrinkable bottel. We are provide very high quality of heat-sealing machine and branded Sleeve Shrinking machines. It's very easy used.